Silver Spring, Md. (Friday, December 14, 2018) – The Siemens Foundation, one of the country’s premier organizations advancing STEM workforce development and education initiatives, and Discovery Education, the leading provider of digital content and professional development for K-12 classrooms, today announced the launch of the 2019 Possibility Grant Sweepstakes. The $10,000 grant provides the opportunity to enhance science, technology, engineering and math (STEM) education experiences and access to immersive learning for K-12 youth. This year, the Siemens Foundation and Discovery Education are collaborating with Title I schools across the nation to encourage grant application participation. Together, they are partnering with districts, states, and like-minded organizations to captivate students, empower teachers, transform classrooms and increase academic achievement. The $10,000 grant will be utilized by school leaders to purchase STEM-related equipment, supplies and technology, or to refurbish existing STEM labs. The collaboration between the Siemens Foundation and Discovery Education ensures that K-12 students are given access to the tools they need to succeed in the 21st-century. 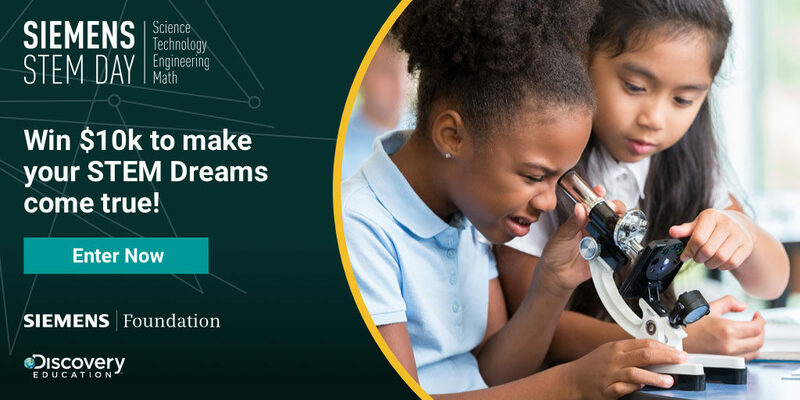 K-12 educators, parents and school communities are invited to support the Possibility Grant Sweepstakes by voting for their favorite school once daily, until April 27, 2019, at SiemensSTEMDay.com/sweepstakes. Participants are also encouraged to join the Siemens STEM Day conversation on social media using the hashtag #IDreamofSTEM in the months leading up to the grand prize announcement. Available at no-cost, the Siemens STEM Day program emphasizes the importance of STEM through over 150 proven, fun and engaging hands-on activities. Siemens STEM Day has adapted Discovery Education’s 4Cs STEM skills framework – collaboration, communication, creativity and critical-thinking – to extend and deepen students’ interest in STEM through immersive classroom activities. In addition to more than 150 free elementary and middle school activities, the Siemens STEM Day website now offers high school resources designed to support STEM curriculum and instruction with digital content. Interactive student activities can be filtered by grade level, category or career path, and explore topics spanning healthcare, engineering, IT, science, math, technology, energy and manufacturing. Siemens STEM Day also offers a Teacher Support Center that provides educators five-minute prep refreshers and downloadable one-sheets for best practice and how-to guides. To learn more about the 2019 Possibility Grant Sweepstakes and download the program’s free resources, visit siemensstemday.com. Siemens STEM Day resources are also available through Discovery Education Streaming. For more information about Discovery Education’s digital content and professional development services, visit discoveryeducation.com. Stay connected with Discovery Education through social media on Facebook, Twitter, Instagram and Pinterest @DiscoveryEd. The Siemens Foundation has invested more than $115 million in the United States to advance workforce development and education initiatives in science, technology, engineering and math. The Siemens Foundation’s mission is inspired by the culture of innovation, research and continuous learning that is the hallmark of Siemens’ companies. Together, the programs at the Siemens Foundation are closing the opportunity gap for young people in the U.S. when it comes to STEM careers and igniting and sustaining today’s STEM workforce and tomorrow’s scientists and engineers. For further information, visit siemens-foundation.org or follow @sfoundation.